Carpet cleaning is best done by professionals, equipped with the right materials and gear for the job. A clean and fresh carpet not only looks good but also improves indoor air quality and increases overall premises hygiene, quite important for both residential and commercial properties. 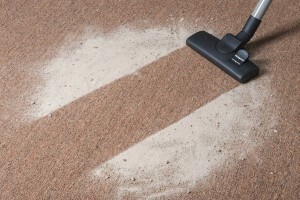 One of the solutions available to customers is our dry carpet cleaning at Cleaners Liverpool. The service is a suitable alternative to steam carpet cleaning as it delivers the same great results though at reduced drying time of about forty percent. The dry cleaning service we offer is perfectly safe and suitable for all types of natural and synthetic fibre carpets. The products and equipment used in the cleaning process will not affect or alter the visual or comfort properties of rugs and carpets subject to cleaning. The service can be performed as many times, and as frequently as necessary without risk of damage to fibres, appearance or properties of carpets and rugs. 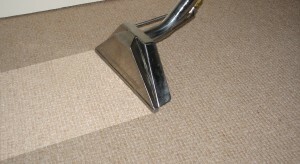 The dry carpet cleaning is a service performed in a number of steps or stages. Each one performed in strict order as to yield optimal cleaning results in the shortest time possible. Step 1 – Application of a specially formulated cleaning compound. This is done using a special machine which spreads the cleaning compound evenly across the surface of the carpet or rug being cleaned. The dry cleaning compounds itself contains tiny water droplets, coupled with solvent or detergent particles. The cleaning agents in the compound work by agitating grime, dirt and soiling clinging to carpet/rug fibres, these are also loosened and softened by the small amount of water present in the cleaning compound. The active ingredients in the compound create a thick foam which is worked evenly across the carpet/rug as to ensure consistent and complete removal of high percentage of dirt and soiling. Step 2 – Once the cleaning compound has done its job and the dirt and soling are lifted by the thick foam, the next step would be to remove it by means of vacuuming. Vacuuming is done using high powered, industry grade machines which remove all foam, and most of the moisture from the carpet/rug. When dealing with stubborn staining or excessive amounts of soiling, the process might have to be repeated a second time in order to achieve complete removal and perfect hygiene. The dry cleaning method works deep inside fibres, all the way down to the carpet/rug’s base. In order to yield consistent, high quality cleaning results, our dry carpet cleaning in Liverpool is carried out by specially trained and qualified technicians who have the necessary skills and experience for the job. Use of professional grade dry cleaning systems ensures no risk of damage, minimum resource waste and reduced service time. This makes the service all the more convenient and efficient. Our dry carpet cleaning and floor cleaning services in Liverpool are affordable and will not be a strain for your home or office budget. The cleaning is available as one off or on a regular basis, depending on individual requirements.